Trucking businesses are growing quickly as a result of an increased demand. This need is predicted to continue growing over time and presents an opportunity for those looking to start their own trucking businesses. 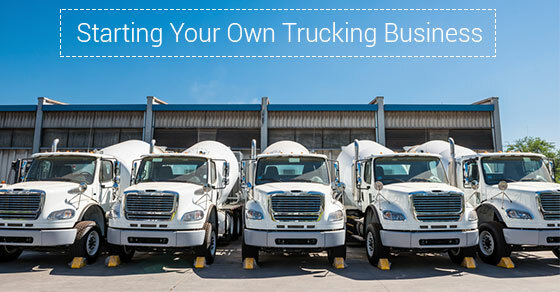 There are many factors that you’ll need to consider as you begin building your own trucking business. The result will be a long-lasting and rewarding career that offers a unique sense of independence while providing valuable services to others. Starting a trucking business requires that you obtain proper licensing. There are a number of driving schools available to provide the proper training to obtain your licensing and certifications, and the cost of these training programs can be met through the use of various forms of financial aid. These include government scholarships, loans, and grants. You’ll need to research all of your options to ensure that you obtain the right financial assistance for your needs. Truck drivers must also meet a number of regulations that require additional capital to cover the cost of registration fees and insurance. You’ll need to have the proper driver’s license and other documentation that relates to the specific freight you’ll be transporting through your trucking business. The equipment you’ll use in your business is one of the biggest factors when getting started. Trucking business owners can choose to purchase or lease their equipment. The choice you make will depend on many factors including your financial needs and long-term goals. Purchasing equipment can be done by providing a down payment and financing the remaining balance, and once you’ve repaid any loans you’ve acquired, you become the sole owner of your equipment. The second option consists of leasing your equipment. Leases are slightly more complex than purchases, but they offer unique benefits such as lower monthly payments. Some leases may allow the option of ownership as well, so it’s important that you research all of your leasing options and fully understand the terms and conditions of each. Whether you purchase or lease your equipment depends on your business needs. Making the right choice as you start your own trucking business will prevent any unwanted issues in the future. Truck driving offers an opportunity to build a profitable business for you and your family, but you should understand all of the costs related to running your business to ensure that you make money over time. Expenses related to a trucking business include vehicle maintenance and repairs, monthly equipment payments, and the cost of fuel. The type of freight you transport and any necessary licenses related to it will also factor into the cost. Having a clear understanding of all of your expenses, you’ll have a better idea of how to price your services for maximum profit. Planning in advance will pave the way for a successful trucking business.